For the civil use of the facility, see U-Tapao International Airport. 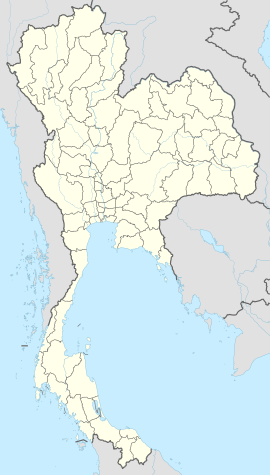 U-Tapao Royal Thai Navy Airfield is a military airfield of the Royal Thai Navy (RTN) approximately 140 kilometres (87 mi) southeast of Bangkok in the Ban Chang District of Rayong Province near Sattahip on the Gulf of Thailand. It is serves as the home of the RTN First Air Wing. U-Tapao (Thai: อู่ตะเภา) is a compound of อู่ cradle and ตะเภา trade winds, and derives from the site having once been a shipyard for construction of ruea-tapao (เรือตะเภา), a type of argosy resembling a Qing Dynasty junk. In 1965 the RTN was permitted by the Council of Ministers to build a 1,200 meter long airfield near U-Tapao village, Ban Chang District, in Rayong Province. The US, seeking a Southeast Asian B-52 base, reached an agreement with the Thai government to build and operate the base in conjunction with the Royal Thai Navy. The US began construction of the runway and all facilities on 15 October 1965 and completed it on 2 June 1966. The base was administratively handed over to the RTN on 10 August 1966. The 11,000-foot (3,355 m) runway became operational on 6 July 1966 and U-Tapao received its first complement of United States Air Force (USAF) Strategic Air Command (SAC) KC-135 tankers in August 1966. The USAF had been flying B-52 Operation Arc Light bombing missions from Kadena Air Base on Okinawa, but Okinawa was judged to be too far from Vietnam to meet mission requirements. An optimal solution was to base the B-52s in South Vietnam or Thailand, however base security in South Vietnam was problematic. U-Tapao had an existing runway suitable for the bombers and the cost for upgrades to the base was minimal. In January 1967, negotiations between the US and Thai government started to base them at U-Tapao. The agreement, reached on 2 March 1967, allowed 15 B-52s and their support personnel to be based at U-Tapao, with the provision that missions flown from Thailand would not over fly Laos or Cambodia on their way to targets in Vietnam. The first B-52's arrived on 10 April 1967. The next day, B-52 sorties were flown from U-Tapao. By 1972 there were 54 B-52 aircraft stationed in Thailand. For several years, beginning in 1981, U-Tapao has hosted parts of Cobra Gold, the largest US military peacetime exercise in the Pacific, jointly involving US, Singaporean, and Thai armed forces, and designed to build ties between the nations and promote interoperability between their military components. Thailand is an important element in The Pentagon's strategy of "forward positioning". Despite Thailand's neutrality on the 2003 invasion of Iraq, the Thai government allowed U-Tapao to be used by American warplanes flying into combat in Iraq, as it had earlier done during the war in Afghanistan. In addition, U-Tapao may be where Al Qaeda operative Abu Zubaydah was interrogated, according to some retired American intelligence officials. A multinational force headquarters was established at U-Tapao to coordinate humanitarian aid for the Sumatran tsunami of 26 December 2004. On 7 May 2008, in the aftermath of Cyclone Nargis, Thai C-130 transports were permitted to land at Yangon International Airport in Burma, carrying drinking water and construction material. From 12–20 May, USAID and the U.S. Department of Defense (DOD) coordinated the delivery of nearly US$1.2 million of relief commodities to Yangon on 36 DOD C-130 flights, with supplies sufficient to provide assistance to more than 113,000 beneficiaries. The DOD efforts were under the direction of Joint Task Force Caring Response. As of 26 June 2008, United States assistance directed by the USAID DART (Disaster Assistance Response Team) stationed in Thailand, had totaled US$41,169,769. Units involved were the 36th Airlift Squadron (36 AS) of the 374th Airlift Wing (374 AW) from Yokota Air Base, Japan, flying C-130H Hercules; and Marine Aerial Refueler Transport Squadron 152 (VMGR-152) from Marine Corps Air Station Futenma, Okinawa, Japan, flying the Lockheed Martin KC-130R and the newer KC-130J. In 2012, a proposal for the United States National Aeronautics and Space Administration (NASA) to use U-Tapao to support weather research was rejected by the Thai government. In 2015, a Politico article reported that the United States Government rented space at U Tapao from a private contractor for use as a "major logistics hub for the Iraq and Afghanistan wars." Because the lease was technically with a private contractor, this allowed "U.S. and Thai officials to insist there's no U.S. 'base' and no inter-governmental basing agreement." Prior to 1965, the base at U-Tapao was a small RTN airfield. At Don Muang Air Base near Bangkok, the USAF had stationed KC-135 tanker aircraft to refuel combat aircraft over the skies of Indochina. Although Thailand was an active participant in the Vietnam War, with a token ground force deployed to the South Vietnam as well as involved in the largely-secret civil war in Laos, the presence and the visibility of USAF aircraft near its capital city was causing a fair degree of political embarrassment for Thailand's military government. In June 1965, the B-52 was first used in the Vietnam War. B-52 aircraft from the 7th and 320th Bomb Wings were sent to bomb suspected Viet Cong enclaves in South Vietnam, the operation being supported by KC-135As stationed at Kadena AB on Okinawa. In September 1966 2 radio relay KC-135A Combat Lightning aircraft and their personnel were ordered to deploy to U-Tapao to support air operations over North Vietnam. The expansion of U-Tapao RTN airfield began in October 1965. The runway was built in eight months and the base was completed slightly more than two years later. The 11,500-foot (3,505 m) runway was opened on 6 July 1966 and the first aircraft to land was a Royal Thai Air Force HH-16 helicopter, then a USAF C-130 Hercules cargo aircraft. With the completion of U-Tapao, most US forces were transferred from Don Muang, and U-Tapao RTNAF became a front-line facility of the United States Air Force in Thailand from 1966 to 1975. The 4258th Strategic Wing (SAC) was activated in June 1966 at U-Tapao under the 3rd Air Division, Andersen AFB, Guam. The wing was charged with the responsibility of supporting refueling requirements of USAF fighter aircraft in Southeast Asia, plus conducting bombing missions on a daily basis. Steadily progressing and adding to the mission, U-Tapao welcomed its first complement of KC-135 tankers in August 1966. By September, the base was supporting 15 tankers. From 1966 to 1970, 4258th wing tankers flew over 50,000 sorties from U-Tapao. The Seventh Air Force (PACAF) wanted additional B-52s missions flown in the war zone. B-52 missions from Andersen and Kadena, however, required long mission times and aerial refuelling en route. Having the aircraft based in South Vietnam made them vulnerable to attack. It was decided that, as the base at U-Tapao was being established as a KC-135 tanker base, to move them all out of Don Muang and to also base B-52s at U-Tapao where they could fly without refuelling over both North and South Vietnam. In early-October 1968, a KC-135A tanker (55-3138) lost power in the outside right engine (#4) on takeoff at U-Tapao and crashed, killing all four crew members. These units deployed usually on 90 days tours. Beginning in March 1969, B-52s were raiding not only South Vietnam and Laos, but Cambodia as well. The Nixon Administration had approved this expansion of the war not long after entering office in the spring of 1969. Cambodian bombing raids were initially kept secret, and both SAC and Defense Department records were falsified to report that the targets were in South Vietnam. The Cambodian raids were carried out at night under the direction of ground units using the MSQ-77 radar, which guided the bombers to their release points and indicated the precise moment of bomb release. This made deception easier, as even crew members aboard the bombers did not have to know what country they were bombing. However, the specific flight coordinates (longitude and latitude) of the points of bomb release were noted in the navigator's logs at the end of each mission, and a simple check of the map could tell the crews which country they were bombing. On 21 January 1970, the 4258th SW was redesignated as the 307th Strategic Wing. The 307th was the only regular Air Force SAC Wing stationed in Southeast Asia. The 307th was under the command and control of Eighth Air Force, based at Andersen AFB, Guam. In addition, two four-digit bomb squadrons (4180th, 4181st) were assigned, but were not operational. Detachment 12 of the 38th Aerospace Rescue and Recovery Squadron operating 2 HH-43s provided search and rescue at the base. In May 1970 USAF tactical airlift C-130s that had been based at Don Muang Air Base moved their operations to U-Tapao and the 6th Aerial Port Squadron followed in July. The C-130s were withdrawn in late-1971 but returned in April 1972. On 10 January 1972, 3 attackers, most likely from the communist People's Liberation Army of Thailand (the PLAT, which was the Communist Party of Thailand's armed wing), attempted to destroy B-52s in a sapper attack using grenades and satchel charges. One attacker was apparently killed in the attack, while the other 2 managed to cause minor damage to 3 B-52s before fleeing the base. In late March 1972, the North Vietnamese launched a full-scale offensive across the Vietnamese Demilitarized Zone, supported by tanks and heavy artillery. By this time, the US was no longer in the forefront of the ground war, with South Vietnamese units taking the lead. However, the US was still providing air power, and President Richard Nixon ordered a large increase on US airpower in response to the invasion. Although there had been no campaign of strikes into North Vietnam since the end of Rolling Thunder, the Nixon Administration ordered a new air offensive, initially code named Freedom Train, later becoming Operation Linebacker, with relatively few restrictions on targets that could be hit. At this time 51 B-52s were based at U-Tapao. The B-52s conducted a limited number of strikes against North Vietnam as part of the spring 1972 invasion, though most of their sorties were on Arc Light missions elsewhere. The North Vietnamese offensive was crushed, but the strikes on North Vietnam continued, only winding down in October, ahead of the United States presidential election, 1972, which resulted in Richard Nixon being re-elected and the attacks quickly ramped up again in November. In late 1972, B-52s were confronted with surface-to-air missile (SAM) defenses. On 22 November 1972, a B-52D was damaged by an SA-2 SAM in a raid on Vinh, an important rail center in the southern part of North Vietnam. The bomber's pilot managed to get the burning aircraft back to Thailand before the crew bailed out, leaving the aircraft to crash. All the crew were recovered safely. The Paris Peace Accords were signed on 27 January 1973, however, the B-52's war was not quite over, with Arc Light strikes on Laos continuing into April and on Cambodia into August. The 307th SW ended all combat operations on 14 August 1973. In the two years following the Paris Peace Accords, the People's Army of Vietnam (PAVN) underwent a massive rebuilding to recoup the losses suffered during their failed 1972 Easter Offensive. On 12 December 1974 the PAVN attacked Phuoc Long. The lack of any US response convinced the North Vietnamese leadership that the time was ripe to seize the South and they quickly launched their 1975 Spring Offensive overrunning many of the major cities and defensive positions in South Vietnam during March and April. By early April the South Vietnamese made their last stand at Xuân Lộc on their final defensive line before Saigon. Xuân Lộc fell on 20 April and South Vietnamese President Nguyễn Văn Thiệu resigned the following day, fleeing the country 4 days later. Republic of Vietnam Air Force (RVNAF) C-47s, C-119s and C-130s filled to capacity with men, women and children, began flying into U-Tapao on 28 April as command and control collapsed, with a total of 123 aircraft arriving at U-Tapao. After their arrival, the Vietnamese were sequestered in tents near the runway. The adjacent parking ramps and grassy areas were being filled to capacity with South Vietnamese helicopters and aircraft. VC-47A 084 of Air America crashed on landing on a flight from Tan Son Nhut. On 30 April the South Vietnamese government surrendered. The handful of RVNAF planes that had been performing last-ditch air strikes completed their missions and flew to U-Tapao. On 14 October 1973 following the 1973 Thai popular uprising former Supreme Court Judge Sanya Dharmasakti, then chancellor and dean of the faculty of law at Thammasat University, was appointed prime minister by royal decree, replacing the succession of staunchly pro-American and anti-Communist military dictatorships that had ruled Thailand previously. With the fall of both Cambodia and South Vietnam in the spring of 1975, the political climate between Washington and the government of PM Sanya had soured. Immdiately after the news broke of the use of Thai bases to support the Mayaguez rescue the Thai Government lodged a formal protest with the US and riots broke out outside the US Embassy in Bangkok. :256 The Thai government wanted the US out of Thailand by the end of the year. The USAF implemented Palace Lightning, the plan to withdraw its aircraft and personnel from Thailand. The SAC units left in December 1975; and the 3rd Aerospace Rescue and Recovery Group left on 31 January 1976,:152 however the base remained under US control until it was formally returned to the Thai government on 13 June 1976. ^ Airport information for VTBU at World Aero Data. Data current as of October 2006.Source: DAFIF. ^ Airport information for UTP at Great Circle Mapper. Source: DAFIF (effective October 2006). ^ "U-Tapao History". U-Tapao Rayong Pattaya International Airport. Retrieved 3 February 2019. ^ "U Tapao-Pattaya International Airport" (PDF). U Tapao Airport Authority. Archived from the original (PDF) on 25 May 2011. Retrieved 6 February 2013. ^ "U-Tapao Royal Thai Navy Airfield Historical Brief" (PDF). Vietnam Dog Handler Association. Archived (PDF) from the original on 15 September 2012. Retrieved 15 November 2017. ^ News, A. B. C. (14 September 2007). "EXCLUSIVE: Sources Tell ABC News Top Al Qaeda Figures Held in Secret CIA Prisons". ABC News. Archived from the original on 4 July 2017. Retrieved 6 May 2018. ^ "Joint Task Force Caring Response brings help to Burmese citizens". af.mil. 12 December 2012. Archived from the original on 12 December 2012. Retrieved 6 May 2018. ^ "Thailand rejects Nasa base request". News24. Reuters. 26 June 2012. Archived from the original on 2 February 2017. Retrieved 20 January 2017. ^ "Where in the World Is the U.S. Military?". politico.com. Archived from the original on 2 March 2018. Retrieved 6 May 2018. ^ a b Nalty, Bernard (2000). The United States Air Force in Southeast Asia: The War in South Vietnam Air War over South Vietnam 1968–1975 (PDF). Air Force History and Museums Program. p. 277. ISBN 9781478118640. ^ "Thai airfield is dedicated, built by U.S." The Morning Record. Meriden, CT. Associated Press. 11 August 1966. p. 10. ^ Yared, Antoine (17 August 1966). "Thais quiet about U.S. use of bases". Eugene Register-Guard. Associated Press. p. 6B. ^ "Bomber move sought by U.S." Beaver County Times. Beaver, PA. UPI. 15 October 1970. p. A11. ^ "Thailand: A Plum". Reading Eagle. Associated Press. 11 September 1966. p. 20. ^ a b c Schlight, John (1999). The United States Air Force in Southeast Asia: The War in South Vietnam The Years of the Offensive 1965–1968 (PDF). Office of Air Force History. p. 152-3. ISBN 9780912799513. ^ "1955 USAF serial numbers". Joseph F. Baugher. Archived from the original on 25 February 2015. Retrieved 1 August 2014. ^ Accident description for 55-3138 at the Aviation Safety Network. Retrieved on 1 August 2014. ^ "USAF tanker crashes on way to war planes". Virgin Islands Daily News. Associated Press. 3 October 1968. p. 4. ^ a b c Ravenstein, Charles A. (1984) (1984). Air Force Combat Wings Lineage and Honors Histories 1947–1977 (PDF). Office of Air Force History. p. 154. ISBN 0912799129. ^ a b Tilford, Earl (1980). Search and Rescue in Southeast Asia 1961–1975 (PDF). Office of Air Force History. p. 113-5. ISBN 9781410222640. ^ a b c d e Bowers, Ray (1983). The United States Air Force in Southeast Asia: Tactical Airlift (PDF). U.S. Air Force Historical Studies Office. p. 410. ISBN 9781782664208. ^ Vick, Alan (1995). Snakes in the Eagle's nest: A history of ground attacks on air bases (PDF). RAND Corporation. p. 83-4. ISBN 9780833016294. ^ a b c d e Thompson, Wayne (2000). To Hanoi and Back The United States Air Force and North Vietnam 1966–1973 (PDF). Air Force History and Museums Program. p. 223. ISBN 978-1410224712. ^ "ASN Wikibase Occurrence # 48322 22-NOV-1972 Boeing B-52D-65-BO Stratofortress". Aviation Safety Network. Retrieved 22 July 2018. ^ a b c d e f g h Dunham, George R (1990). U.S. Marines in Vietnam: The Bitter End, 1973–1975 (Marine Corps Vietnam Operational Historical Series). Marine Corps Association. pp. 123–4. ISBN 978-0-16-026455-9. ^ Tobin, Thomas (1978). USAF Southeast Asia Monograph Series Volume IV Monograph 6: Last Flight from Saigon. US Government Printing Office. p. 81. ISBN 978-1-4102-0571-1. ^ "084 Accident description". Aviation Safety Network. Archived from the original on 19 September 2011. Retrieved 21 August 2010. ^ Muir, Malcolm (2017). End of the Saga: The Maritime Evacuation of South Vietnam and Cambodia (PDF). Naval History and Heritage Command. p. 51. ISBN 9780945274926. ^ a b Wetterhahn, Ralph (2002). The Last Battle: The Mayaguez Incident and the end of the Vietnam War. Plume. p. 50. ISBN 0452283337. ^ Marks, Frederick H. (14 May 1975). "Thai leaders protest arrival of U.S. marines". Bryan Times. Bryan, Ohio. UPI. p. 1. ^ "U.S. to begin pullout of troops from Thailand". Miami News. 5 May 1975. p. 2A. ^ "Many Thais saddened by U.S. military withdrawals". Nashua Telegraph. UPI. 3 December 1975. p. 42. ^ Dawson, Alan (21 June 1976). "U.S. out of Thailand". Beaver County Times. Beaver, Pennsylvania. UPI. p. A3. Glasser, Jeffrey D. (1998). The Secret Vietnam War: The United States Air Force in Thailand, 1961–1975. McFarland & Company. ISBN 0-7864-0084-6. Wikimedia Commons has media related to U-Tapao Royal Thai Navy Airfield. U-Tapao – history, photos, maps, etc.